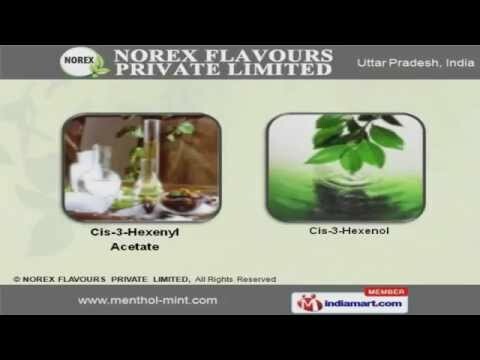 Welcome to Norex Flavours Private Limited, Manufacturer & Exporter of Aroma Chemicals & Essential Oils. Incorporated in 2008, at Dhanaura, we are an ISO 9001:2008, 14001:2004, WHO GMP and FFAI certified company. Asia, Africa, America are some of our major markets. High grade raw material, innovative approach and strict adherence to quality make us the first choice of our clients. We offer a vast range of Essential Oils, Synthetic Aroma Chemicals and Menthol. Menthol & Other Mint Products offered by us are widely acclaimed in the market. We offer Cis-3-Hexenol and Cis-3-Hexenyl Acetate that are in huge demand across the global markets. Natural Aroma Chemicals can be custom formulated as per client specifications. We also provide Synthetic Aroma Chemicals that are a class apart. Along with that we offer Essential Oils that are available at industry leading prices.